In order to get more exposure for tus, we published a piece in Streaming Media's The Platforms, Players & SDKs Superguide (pdf). Here's the full article for your convenience. Both professional and consumer recording devices are constantly producing ever larger video files. With a multitude of formats like 1080p, 4K, 8K, and RAW, for both photos and video, it is getting more common to see file sizes in the range of 10 to 100 GB. Being a company in the transcoding business for nearly ten years, Transloadit began to notice a steady increase in transmission errors and lost or corrupted videos, even though our own encoding clusters handling the ingestion were running smoothly. As it turns out, the quality of networks often isn’t able to keep up with these larger file sizes. In other words, people are pushing more and more weight over the same old primitive suspension bridges. And while, admittedly, these bridges are sometimes upgraded to be wider and people are moving faster, they have certainly not become any sturdier. If you are distributing content over HTTP, you have been in luck. Downloads have already been resumable ever since HTTP version 1.1. But for file ingestion, such as uploading content to an encoding platform, there has never been an open standard. While a number of projects have come to fruition over the years, they were not interoperable because they lacked common language and rules. They had a commercial aim or were focused on their own situation. A fragmented incompatible landscape, a bit like if there was no NFL and every football team just played by their own rules. We at Transloadit decided to do something about this situation. Together with Vimeo and people at Google and GitHub, we set out to create: 'tus.io', an open source file transmission protocol designed to withstand packet loss, mobile sources on the move, and flaky Wi-Fi. In addition to that, it can also be deployed in datacenters to achieve higher performance while exchanging videos between servers. Reliability: When you upload using tus.io, a connection may still drop, but the upload is retried aggressively and only the remaining bytes are uploaded again. This means connection drops are hardly noticeable. 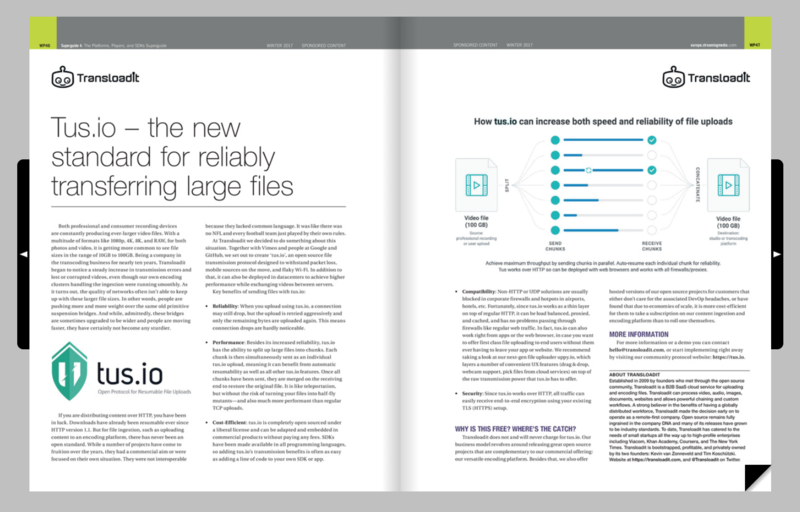 Performance: Besides its increased reliability, tus.io has the ability to split up large files into chunks. Each chunk is then simultaneously sent as an individual tus.io upload, meaning it can benefit from automatic resumability as well as all other tus.io features. Once all chunks have been sent, they are merged on the receiving end to restore the original file. It is like teleportation, but without the risk of turning your files into half-fly mutants – and also much more performant than regular TCP uploads. Cost-Efficient: tus.io is completely open sourced under a liberal license and can be adapted and embedded in commercial products without paying any fees. SDKs have been made available in all programming languages, so adding tus.io's transmission benefits is often as easy as adding a line of code to your own SDK or app. Compatibility: Non-HTTP or UDP solutions are usually blocked in corporate firewalls, hotpots on airports, hotels, etc. Fortunately, since tus.io works as thin layer on top of regular HTTP, it can be loadbalanced, proxied, cached, and has no problems passing through firewalls like regular web traffic. In fact, tus.io can also work right from apps or the web browser, in case you want to offer reliable & performant file uploading to end-users, integral to your product. We recommend taking a look at our next-gen file uploader uppy.io, which layers a number of convenient UX features (drag & drop, webcam support, pick files from cloud services) on top of the raw transmission power that tus.io has to offer. Security: Since tus.io works over HTTP, all traffic can easily receive end-to-end encryption using your existing TLS (HTTPS) setup. Why is this free? Where's the catch? Transloadit does not and will never charge for tus.io. Our business model revolves around releasing great open source projects that are complementary to our commercial offering: our versatile encoding platform. Besides that, we also offer hosted versions of our open source projects for customers that either don't care for the associated DevOp headaches, or have found that due to economies of scale, it is more cost-efficient for them to take a subscription on our content ingestion and encoding platform than to roll one themselves. For more information or a demo you can contact hello@transloadit.com, or start implementing right away by visiting our community protocol website: https://tus.io. Established in 2009 by founders who met through the open source community, Transloadit is a B2B SaaS cloud service for uploading and encoding files. Transloadit can process video, audio, images, documents, websites and allows powerful chaining and custom workflows. A strong believer in the benefits of having a globally distributed workforce, Transloadit made the decision early on to operate as a remote-first company. Open source remains fully ingrained in the company DNA and many of its releases have grown to be industry standards. To date, Transloadit has catered to the needs of small startups all the way up to high-profile enterprises including Viacom, Khan Academy, Coursera, and The New York Times. Transloadit is bootstrapped, profitable, and privately owned by its two founders: Kevin van Zonneveld and Tim Koschützki.